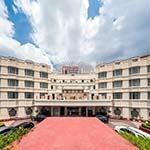 The Claridges is a heritage hotel situated in Lutyens, New Delhi and offers guests a combination of old-world charm combined with contemporary furnishings. Each luxury guest room features wooden flooring and a pillow menu, and is well-equipped with a TV, minibar and tea/coffee making facilities. 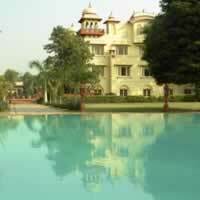 The hotel has a large heated outdoor swimming pool, seven different dining options and an Ayurvedic spa. 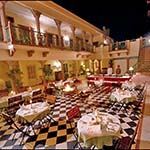 Samode Haveli is a luxury heritage hotel situated in the heart of Jaipur, allowing you to explore the city with ease. Guest rooms have a flat-screen TV with cable channels and air conditioning. 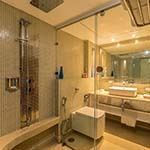 All rooms have a shower hairdryer and private bathrooms come with a bath. Extras include a desk, a safety deposit box, fan and free WiFi. 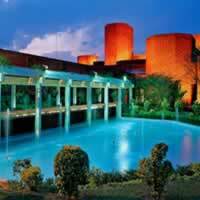 The hotel has a lovely outdoor swimming pool as well as a spa and wellness centre. 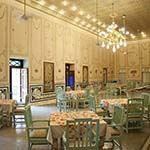 Originally the hunting lodge of the Maharaja of Jaipur, Vivanti Sawai Madhopur has hosted many famous visitors including Queen Elizabeth and Prince Philip. 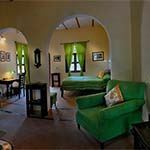 Offering luxury rooms and suites, it is one of the most historic hotels in the Ranthambore region. The art deco main building still has its original dining hall with enormous banqueting table, bar and lounge. 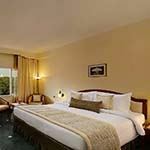 The guest rooms are spacious with all modern comforts and there is a large outdoor swimming pool for your enjoyment. 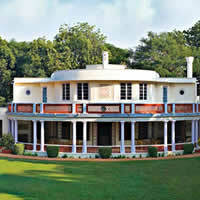 Coral Tree offers an authentic welcoming homestay in Agra, within walking distance of Taj Mahal. Set in lush green surroundings, this small brightly coloured homestead is a haven for birders, with over 100 different recorded species. Each spacious en-suite guest room is individually decorated and feature large windows, tiled floor, king-size bed, beautiful textiles, seating area and a private veranda. 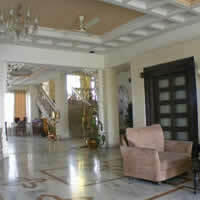 Satellite TV, free Wi-Fi and tea / coffee making facilities are provided. You can relax in the lounge and library or in the garden and enjoy home-cooked meals served in the dining room. 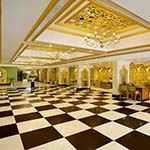 Located within walking distance of the famous Taj Mahal, the Crystal Inn offers stylish accommodation and air-conditioned rooms equipped TV and tea/coffee facilities. 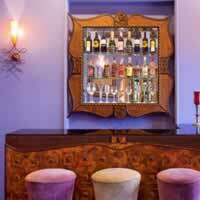 A safety deposit box and minibar are also provided. 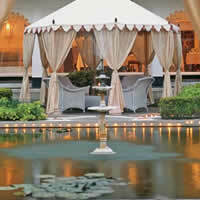 The hotel offers massage services and a rooftop restaurant with beautiful views of the Taj Mahal. 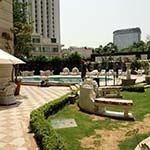 Howard Park The Fern is a modern luxury hotel situated within walking distance of the Taj Mahal in Agra. 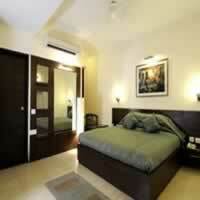 Guest rooms have all the usual modern amenities including free hi-speed Internet, TV, minibar and private bathroom. 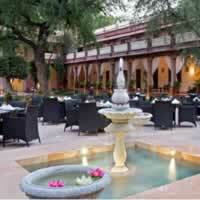 The hotel has two restaurants - Rendezvous for all-day dining and the Terrace Grill. 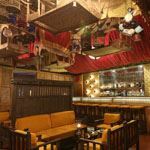 The East India Company is a specialist tea lounge and there is a bar and a rooftop lounge. Other facililties include the Elixir Spa, a fully equipped gym, outdoor swimming pool and shop that sells art produced by local artists. 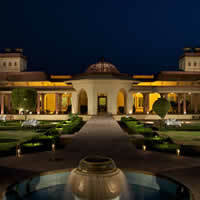 Clarkes Shiraz is set in 8-acres of beautifully landscaped gardens in Agra, with views of the Taj Mahal and Agra Fort. 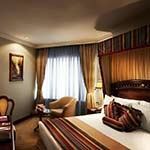 Each spacious guest room is well-appointed and has air conditioning, mini bar, hairdryer and tea/coffee facilities. 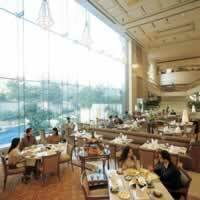 Several restaurants offer an array of delectable cuisine ranging from Mughlai, Continental and Chinese to a variety of exotic beverages. There is also an excellent spa. 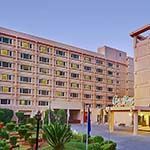 DoubleTree by Hilton is a luxury hotel situated close to the main sights of Agra and offers an oasis of calm away from the bustle of the city. 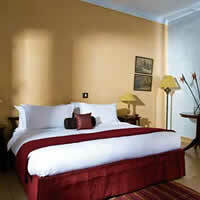 All guest rooms are spacious and en-suite, offering all the facilities expected from a modern hotel including free WiFi. There is an outdoor swimming pool, as well as a spa and wellness centre and choice of restaurants. 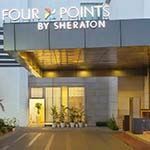 Four Points by Sheraton is a modern luxury hotel situated a short drive from Agra Fort, with distant views of the Taj Mahal. Each air conditioned en-suite room is spacious with luxury bed linen, bathrobes, slippers, satellite TV, tea/coffee facilities, minibar and high speed WiFi. 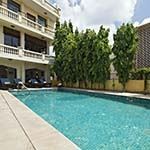 You can enjoy the gym and swimming pool and there is a choice of three restaurants. 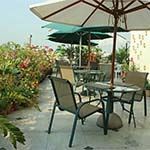 The rooftop restaurant serves Indian and international cuisine, and has views over the city. 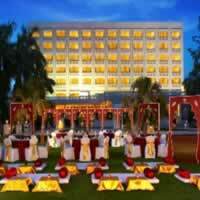 Gateway Fatehabad Road is a luxury hotel set in 6-acres of landscaped gardens in Agra. 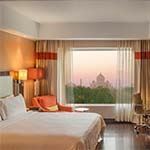 Most rooms have magnificent views of the Taj Mahal and each room has air conditioning, Wi-Fi, TV, safe, tea/coffee facilities, minibar and hair dryer. 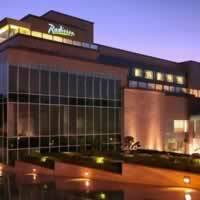 Radisson Blu is located in beautiful parklands on Taj East Gate Road, in the Agra business district. 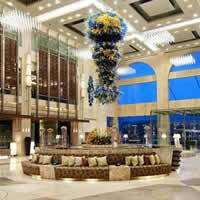 It is a modern luxury hotel with a contemporary design. Services offered include a bar, restaurant, fitness centre, spa, steam room, swimming pool and free WiFi. Each en suite guest room has satellite TV, air-conditioning, safe, tea/coffee facilities, minibar, ironing board and hair dryer. 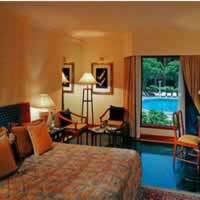 Trident Agra is set in beautiful landscaped gardens with fountains and central courtyard. 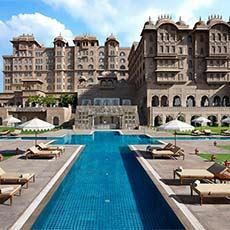 The hotel is built of red stone reminiscent of the Mughal era and close to the Taj Mahal. All rooms are equipped with air conditioning, satellite TV, WiFi, minibar, tea & coffee facilities, electronic safe and hairdryer. 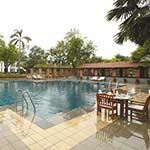 Grand and elegant, the Wyndham Grand Agra boasts beautiful landscaped gardens, an outdoor pool and pampering spa treatments. 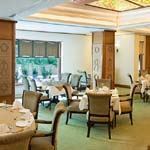 Offering 4 dining options, the hotel is 2 km from the famous Taj Mahal. 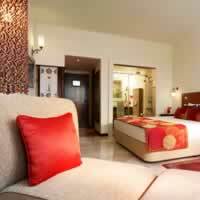 The spacious and well-designed guestrooms are equipped with a flat-screen TV, sofa bed and a well-stocked minibar. En suite bathrooms have a bathtub. 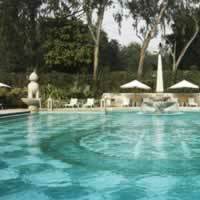 ITC Mughal is a luxury hotel set in 35 acres of lush gardens a few miles from the heart of Agra city and in close proximity to the Taj Mahal. 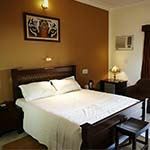 As one of the best hotels in Agra, each spacious bedroom is stylishly decorated and offers all the services and facilities you would expect from an up-market hotel, including air-conditioning, TV, Wi-Fi, tea/coffee facilities, safe and minibar. 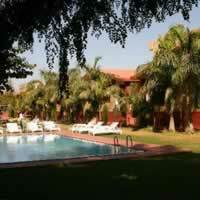 The hotel has excellent restaurants and a large outdoor swimming pool. 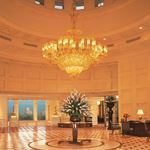 With the iconic Taj Mahal only 650 yards from its door, the luxury Oberoi Amarvilas offers a fairytale setting as well as a top-end hotel experience. As you walk through the opulant lobby, complete with crystal chandeliers, you will be greeted with traditional local hospitality. 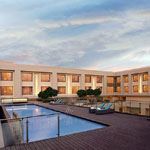 Facilities include a large swimming pool, extensive manicured gardens, a selection of dining options and a spa and wellness centre. 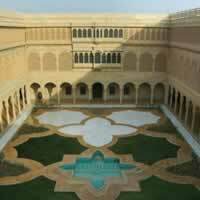 Alsisar Mahal is a luxury heritage property that was once the 17th century palace of the Thakurs of Alsisar. 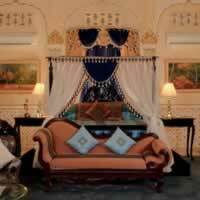 It offers fabulous grandeur and an insight into the opulent lifestyle of Rajasthani royalty - with handpainted walls and ceilings, rich furnishings, fine tapestry, grand courtyards and magnificent dining arcades. The tastefully decorated guest rooms are air conditioned, with wood paneling on the doors and alcoves. WiFi is provided and there is a swimming pool and bar. 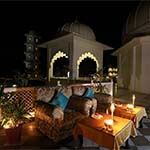 You can dine in one of the two restaurant that serves Indian and Rajasthani food, or on the rooftop terrace. 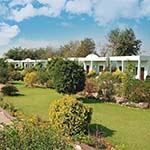 The Bagh is a modest hotel situated in 12-acres of well established gardens, close to Keoladeo Bird Sanctuary in Bharatpur. 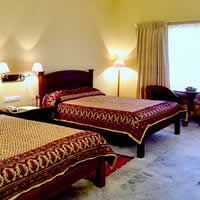 The accommodation is fairly simple, with guest rooms spread out over three residential complexes. Each spacious bedroom has a private bathroom with modern amenities. There is an on-site restaurant. 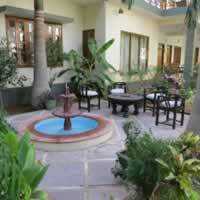 Birders Inn offers simple but comfortable accommodation for serious birders in Bharatpur. 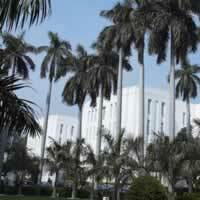 It is situated in pristine natural surroundings out of town, close to the entrance to Keoladeo Ghana Bird Sanctuary. All en-suite guest rooms are equipped with air conditioning, ceiling fans and cable TV. Deluxe rooms also have a bath. 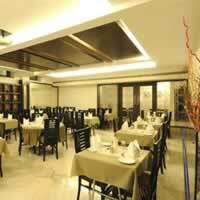 The restaurant and grill serves a variety of delicious à la carte and buffet meals. Local naturalists are available for visits into the bird sanctuary. 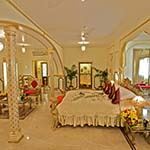 Udai Vilas Palace is simple heritage-style hotel set in 4-acres of lush gardens in Bharatpur, offering traditional Rajasthani hospitality and all modern amenities. It is close to the entrance to Keoladeo Ghana Bird Sanctuary. 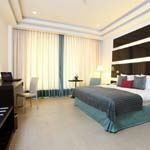 The spacious guest rooms are all en-suite, with air conditioning, satellite TV, minibar and tea/coffee facilities. 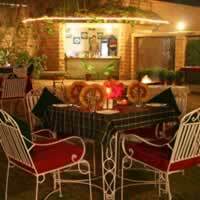 The restaurant serves traditional Rajasthani food as well as international dishes and barbeques under the stars. Other facilities include a large outdoor swimming pool and free WiFi. Naturalist guides are available if required. 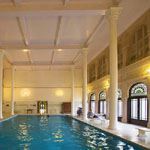 Laxmi Niwas hotel is housed in a majestic palace built in 1902, and features Indo-Saracen architecture with its filigree and lattice work. Featuring ornate furnishings, rooms come with a desk, seating area and electric kettle. The en suite bathroom has a shower and free toiletries. 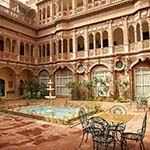 Bhanwar Niwas is a magnificent heritage hotel situated in the heart of Bikaner, not far from museums and cultural attractions. 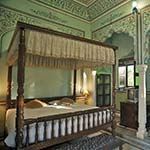 With stunning Indian and European-influenced architecture and stone floors, the en-suite guest rooms are individually furnished and decorated with paintings and antiques. Air-conditioning, ceiling fans and complimentary toiletries are provided. 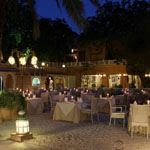 The hotel has two restaurants and you can relax in the drawing room, on the roof terrace or in the beautiful courtyard. 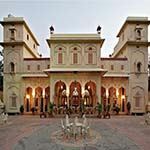 Displaying a perfect example of Indo-saranic architecture, this impressive palace is now a heritage hotel giving guests the opportunity to immerse themselves in the culture of the Raj. 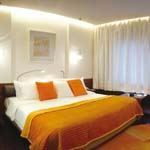 Rooms are spacious, with traditional furnishings and there is a swimming pool, bar and restaurant to enjoy when not out sightseeing. 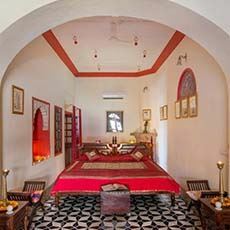 Bundi Vilas is an intimate heritage townhouse, built against the rampart walls of the City Palace in the historic town of Bundi. 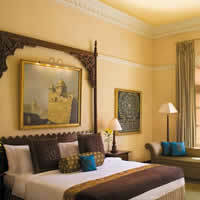 The air-conditioned guest rooms retain their original architectural features, with stone pillars and scalloped alcoves. 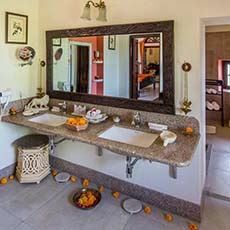 Each en-suite room has traditional Rajasthani décor featuring block-printed fabrics, local crafts, stone-tiled floors and wooden furniture. 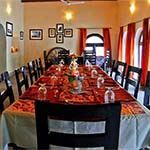 You can dine on authentic vegetarian home cooking and relax under the stars on the rooftop terrace, with panoramic views over Jait Sagar Lake and across to the Aravalli Hills. 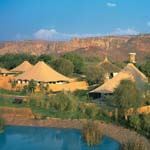 Chambal Safari Lodge is situated in the restored Mela Kothi family homestead, nested in 35-acres of woodland and farmland in the Chambal Valley. Each spacious cottage is en suite, with all modern amenities combined with some period features. The kitchen prepares authentic home cooked buffet meals, using fresh organically grown ingredients from their own or neighbouring farms. Beautiful old trees, extensive gardens and restored 18th century stable block provide an idyllic setting for mealtimes and evening bonfires are a good opportunity to interact with other guests or simply relax and enjoy star gazing. 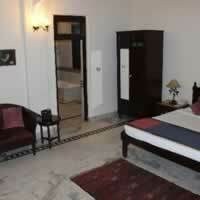 Chanoud Garh is a charming family-run heritage hotel situated in Chanod in rural Rajasthan. 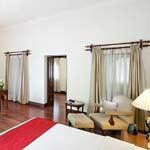 This beautifully restored 300-year old royal palace features dramatic marble pillared corridors and courtyards. 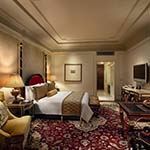 The luxury guest rooms and suites are decorated with a combination of antique furniture and modern amenities. 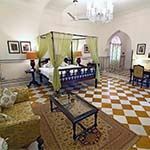 Each room has an en-suite bathroom and lounge area - with stone archways, stained-glass windows and frescos featuring in many of them. 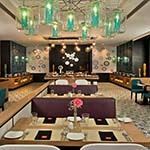 The restaurant serves regional Indian, Chinese and international cuisine on tables covered with beautiful Rajasthani textiles. 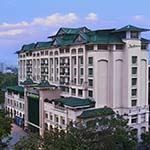 City Park is a luxury hotel situated in New Delhi, offering spacious guest rooms with air conditioning, wood flooring and furnishings. Each room has a private bathroom with a bathtub, cable TV, minibar and safe. There is a well-equipped health club with sauna, spa offering massages and body treatments and swimming pool. 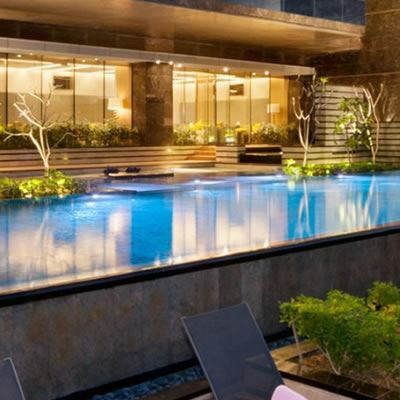 There is also an outdoor swimming pool and several dining options. 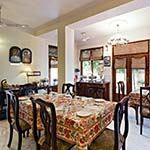 Colonel’s Retreat is a charming eco-friendly hotel situated in a quiet residential area south of New Delhi. The spacious air-conditioned guest rooms are en suite, with walk-in showers, and are elegantly furnished with tiled floors, wooden furniture and colourful textiles. 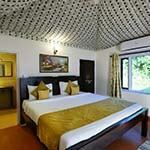 Each has satellite TV, tea / coffee making facilities, fridge, free Wi-Fi and safe. 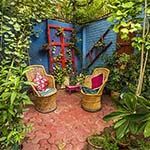 Each floor has a central lounge and there is a tranquil roof terrace surrounded by plants and flowers where tea, afternoon chai, snacks and Indian home-cooked dishes are served. There is a dining room inside the hotel. 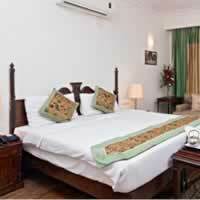 Vikram is a luxury hotel situated in south Delhi, with easy accessibility to the major attractions of the city. 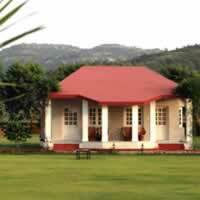 Spread over two acres of land, the hotel offers comfortable accommodation and warm professional service. 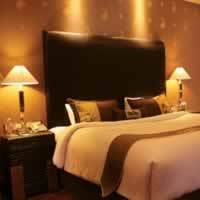 The well-appointed en-suite guest rooms offer all modern amenities and the hotel has a stylish restaurant. 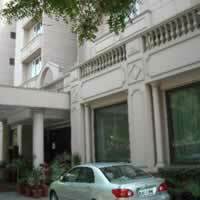 Hans Hotel is centrally located in the New Delhi business district. The modern en-suite guest rooms are air-conditioned and have cable TV, free WiFi and tea/coffee facilities. Communal areas have stylish décor. Caramelo Restaurant serves Italian food, Kaffa Coffee Shop offers international food and Hans' Bar serves snacks and cocktails. 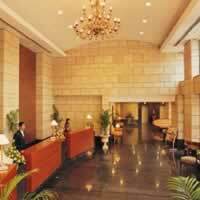 Metroplolitan Delhi is a luxury hotel situated in New Delhi's city centre. 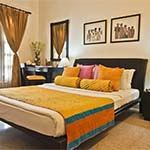 Its contemporary air-conditioned rooms have Indian influenced decor and are elegantly furnished with comfortable king-sized beds, en-suite bath and shower. 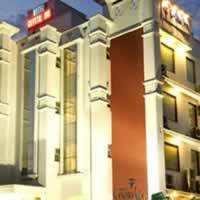 Satellite TV, mini-bar, complimentary toiletries, Wi-Fi and tea/coffee making facilities. Guests can use the gym, spa and outdoor swimming pool. 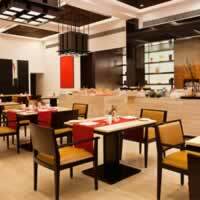 There is a choice of restaurants serving the finest Japanese and Indian cuisine. 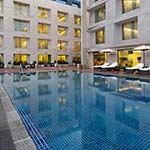 Park Inn by Radisson is a modern luxury hotel situated in central New Delhi close to Humayun’s Tomb, the Red Fort, the Lotus Temple and Akshardham Temple. 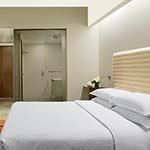 Guest rooms have contemporary décor with all modern amenities including television, free Wi-Fi and private bathroom. 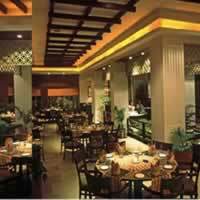 The on-site restaurant, RBG Bar & Grill, offers authentic Indian food as well as international cuisine. Guests can relax by the rooftop swimming pool or work out in the fitness centre. 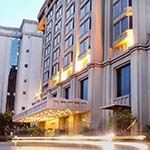 Royal Plaza is a luxury hotel conveniently situated near the centre of New Delhi, with easy access to Jantar Mantar, the National Museum, Parliament of India and India Gate. Each luxury en-suite bedroom has air-conditioning, desk, hair dryer, tea/coffee facilities and safe.The in-room entertainment facilities include LCD television and cable/satellite television channels, with free high-speed WiFi. There is also a large outdoor swimming pool. 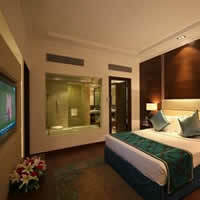 Suryaa is a luxury hotel located in the heart of New Delhi, offering a warm, vibrant and lively ambience. 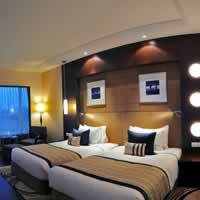 Each elegant room is well-appointed, with all modern conveniences. 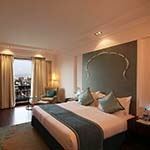 Guest rooms are decorated with modern furnishings, with minimalistic interiors and spectacular views over the city of Delhi. With its ultra-modern decor this central hotel offers the perfect base from which to both sight-see and indulge in a bit of luxury. 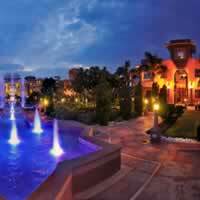 Facilities include a swimming pool, spa and wellness centre, choice of restaurants and night club. All rooms have complimentary wifi. 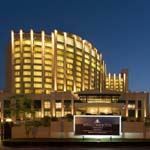 Situated in West Delhi, the Hilton New Delhi Janakpuri offers elegant accommodation with modern amenities. 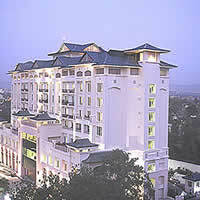 It features spa facilities and a fitness centre. All design rooms are air conditioned and offer a flat-screen TV, cable / satellite channels and tea and coffee making facilities. Each offers facilities such as a mini bar, bottled water and a hair dryer. 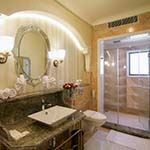 The bathrooms feature a rain shower and a lighted makeup mirror and provide slippers and bathrobes. 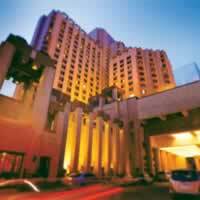 The Imperial is a renowned luxury hotel located close to the city centre of New Delhi. Originally built in 1931 this hotel offers luxury but also a Victorian feel with pictures of days gone by lining its walls. The modern and spacious bedrooms have high ceilings and are equipped with a minibar and tea/coffee facilities, bathrobes, toiletries and hairdryer. 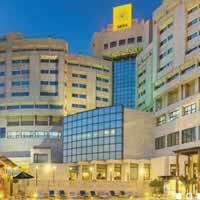 The hotel has a large outdoor swimming pool, as well as a health club and spa and 7 different dining options. 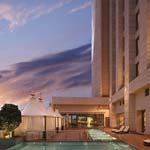 ITC Sheraton is a luxury modern hotel situated in the southern part of New Delhi. 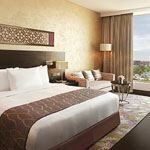 Guest rooms are spacious with all the facilities you would expect from a 5 star hotel, including the Sheraton Signature Sleep Experience. All rooms are en-suite with air-conditioning, TV, WiFi, minibar and safe. Upgrades are available to suites and executive rooms. Treat yourself at one of the four award-winning restaurants, which offer a variety of delectable cuisine, including South Indian and Southeast Asian specialties. 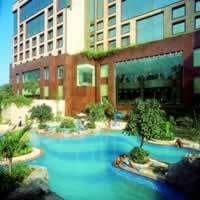 There is also an outdoor swimming pool, fitness centre and spa. 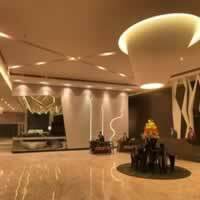 Kempinkski Ambience is a modern luxury hotel situated in east Delhi. Each spacious en-suite guest room is furnished in a contemporary style and comes fully equipped with a flat-screen TV, minibar, hairdryer and tea/coffee facilities. The en-suite bathroom has both a bath and shower, with free toiletries. 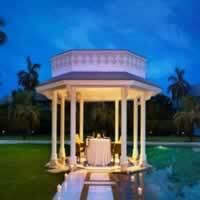 The hotel has three restaurants and a bar, two outdoor swimming pools and a spa. 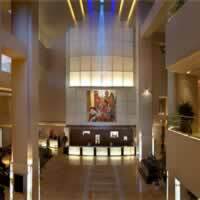 Lalit New Delhi is situated in Connaught Place in the heart of the commercial district and close to an excellent shopping centre. 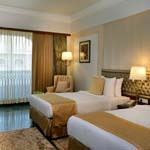 The hotel is conveniently situated for visits to cultural and historical sites such as the India Gate, Jama Masjid and Red Fort. Each luxury bedroom offer an array of modern comforts including air-conditioning, TV, ironing board, mini bar, tea/coffee facilities, WiFi and spacious en-suite bathroom. 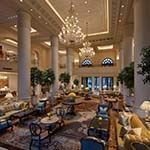 The Leela Palace is one of the most luxurious hotels in New Delhi, offering lavishly appointed rooms and suites. Each room is extremely spacious, with private bathroom and luxury amenities. 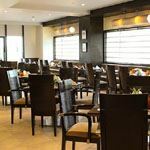 The hotel has many dining options including The Qube (all day dining), Jamavar (signature Indian restaurant), Megu (Japanese), Le Cirque Signature (fine-dining Franco Italian), the Library Bar and the Lobby Lounge. The ESPA Spa offers holistic treatments; there is a well-equipped fitness centre and a heated infinity swimming pool - the only rooftop pool in the city. 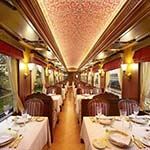 Maharajas Express is the most luxurious train in India, offering 5 fascinating journeys across stunning landscapes, including visits to iconic cultural and heritage sites such as the Taj Mahal. 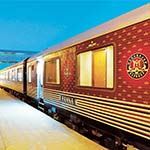 Designed to re-create the pageantry of the journeys of the Maharajas, the train reflects the elegance of a bygone era, combined with state of the art amenities. You can choose between Deluxe Cabin, Junior Suite, Suite or Presidential Suite, each with en-suite facilities and personal butler service. 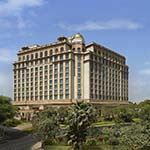 Oberoi Maidens is a historic luxury heritage hotel situated in central Delhi, with a sweeping driveway and pearl-white facade. 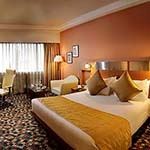 The spacious air-conditioned guest rooms have high ceilings and old-world charm, as well as featuring all modern amenities such as satellite TV, minibar, safe, hairdryer and tea/coffee facilities. Dining options include the Garden Terrace and the elegant Curzon Room restaurant, offering both Indian and international cuisine. There is also free WIFi and a large outdoor swimming pool. 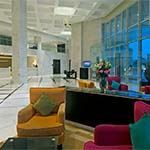 WelcomHotel Dwarka is a luxury hotel situated on the southwest of New Delhi. 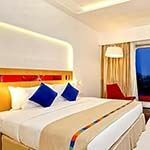 The spacious guest rooms and suites have large well equipped bathrooms with TV and all the other facilities expected of a modern hotel, including a swimming pool, gym, spa and club lounge. 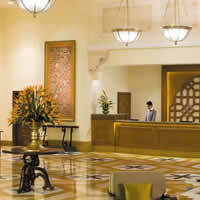 Dining options include K&K (a specialist Indian restaurant), Pavilion 75 and Shanghai Club. There is a shopping arcade on site. 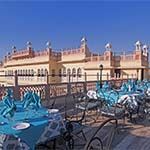 Alsisar Haveli is an historic heritage hotel centrally situated in the heart of the "Pink City" of Jaipur, approximatley 6 miles (10 km) from the Amber Fort. 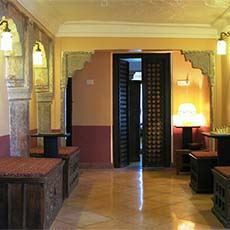 Originally the townhouse of a nobleman, the property features traditional Rajput architecture and has a princely ambience. 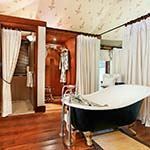 Each luxury guest room features wood-crafted furniture, including a four-poster bed, TV and en-suite bathroom with both shower and bath tub. 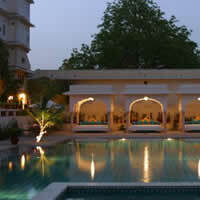 Other facilities include a swimming pool and restaurant that serves Rajasthani specialities. Country Inn & Suites is centrally located close to Jaipur railway station and offers professional service and comfortable accommodation. Each guest room has simple yet modern décor with plush bedding, wing chair, large windows and a variety of modern amenities including TV, mini bar, coffee maker, safe and complimentary morning newspaper. 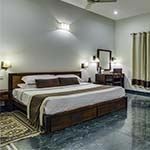 Dera Rawatsar is a family boutique hotel, situated in the heart of Jaipur, near to historical monuments, the heritage walled city and shopping areas. The ensuite, air-conditioned guest rooms have an elegant and traditionally influenced style, with unique pieces of antique furniture and comfortable beds. 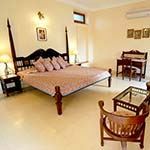 Satellite TV, mini-bar, Wi-Fi and coffee / tea making facilities are provided. Enjoy the outdoor pool, poolside bar and on-site massage treatments. 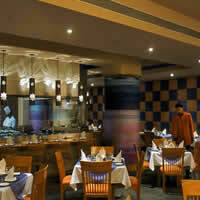 The restaurant serves traditional Indian dishes. 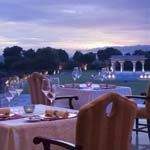 Fairmont is a luxury hotel situated in the foothills of the Aravalli hills in Jaipur, with wonderful architecture inspired by the Mughal dynasty and royal Rajputs. 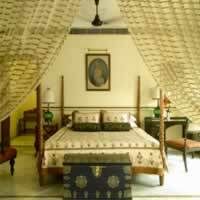 All rooms and suites are elegantly appointed to reflect a blend of traditional Rajasthani décor and modern amenities. 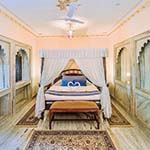 Each spacious room has a four poster bed, camel-bone inlaid furniture, walk-in bathroom with a distinctive pink city stone bath tub, Mughal-style daybed, timber floors, vaulted ceilings and arched windows. TV and high speed WiFi are also provided. 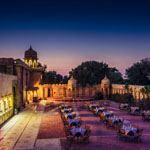 The opulent accommodation is complemented with an array of dining options, including Rajasthani cuisine and a fusion of Indian and Persian cuisine. Other facilities include a library bar and spectacular rooftop restaurant. 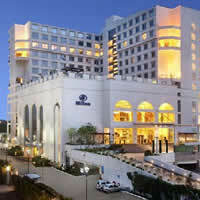 Four Points by Sheraton is a luxury modern hotel situated in City Square, Jaipur. 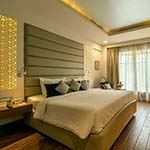 Guest rooms are well appointed, with wonderful views of the city skyline or the majestic Aravali Hills. 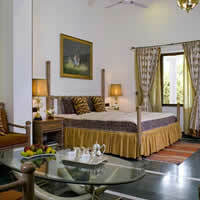 Each air conditioned en-suite room has luxury bed linen, TV, tea/coffee facilities, minibar and high speed Internet. The Eatery provides all day international dining and Best Brews serves a bar menu. Other facilities include a swimming pool and a fitness centre. 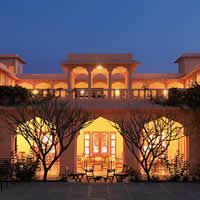 Situated outside the city of Jaipur, step into the world of the Maharajas at the Gateway Ramgarh, which was once the favourite hunting retreat of the Maharaja. This luxury hotel has beautiful en-suite bedrooms with all the modern touches that surprise and lovely views. 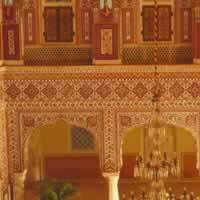 Mandawa Haveli is located in the heart of Jaipur City on Sansar Chandra Road, and is built in the Jaipur style with numerous pillars and arches. 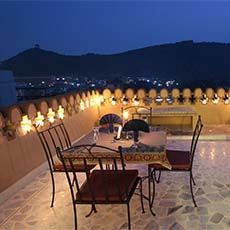 There are pleasant courtyards, lawns and terraces with a view of the splendid Nahargarh Fort. 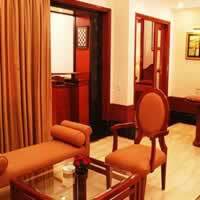 The hotel combines old world charm with the best of present day facilities. 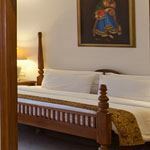 The rooms are well-appointed with intricately carved wooden beds; historic photographs and king-sized royal portraits. 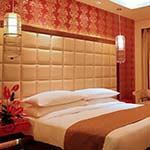 Mansingh Towers is a stylish modern hotel situated in the heart of Jaipur, offering a warm welcome and comfortable accommodation. The spacious polished en-suite rooms feature deep soaking bath tubs. 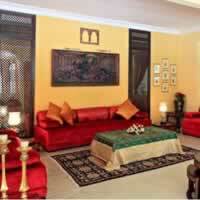 And come with tea/coffee making facilities, minibar, flat-screen TV and Wi-Fi. Other facilities include a casual international restaurant, two bars, coffee shop, outdoor swimming pool, jacuzzi, gym and spa. 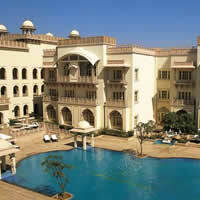 Radisson Jaipur City Centre is a modern luxury hotel located close to Nahargarh Fort Palace and the City Palace. Guest rooms have contemporary décor and all the usual amenities including satellite TV, free WiFi, kettle and private bathroom wih free toiletries. 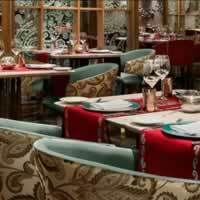 The in-house restaurant specialises in Moroccan, Indian and Chinese cuisine. There is also a bar, fitness centre, spa and wellness centre and outdoor swimming pool. 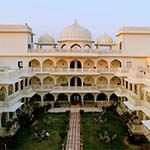 Raj Palace is an historic hotel situated in Jaipur, on the road to the Amber Fort and one of the most famous luxury heritage hotels in India. 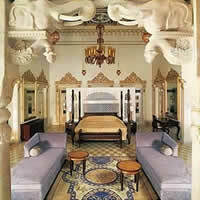 Accommodation ranges from Heritage Rooms to the Shahi Mahal Suite - one of the most expensive in the world. 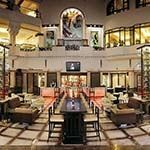 The award winning multi-cuisine restaurant has one of the largest crystal chandeliers in India, as well as antique crockery museum. 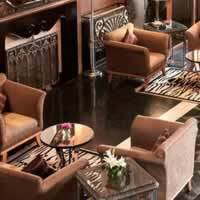 Frequented by royalty, you will see wonderful works of art and many historic pictures on its walls. 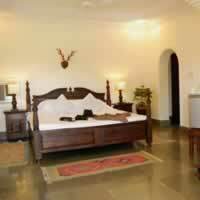 Facilities include daily elephant and camel safaris to Amber Fort, outdoor swimming pool, croquet, Ayurvedic spa, gym & folk dances. Golf & horse riding are nearby. 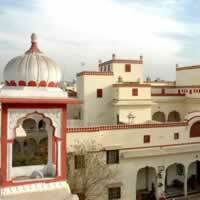 Shahpura House is a magnificent heritage property situated in an up-market residential area of Jaipur. 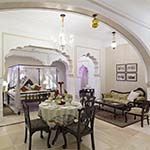 Once the residence of the ruling Shekhawat clan of Rajputs, this luxury boutique hotel is still a family home into which you will be personally welcomed. 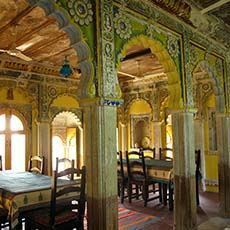 With traditional Rajput architecture, a mixture of Mughal and Indian, and a facade with domes, this house also offers a fine example of Shekhawati frescos. Family portraits add to the charm of this hotel, where tradition still runs strong. 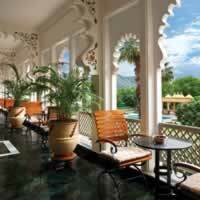 Trident hotel in Jaipur has breathtaking views of Mansagar Lake and the striking Aravalli mountain range. 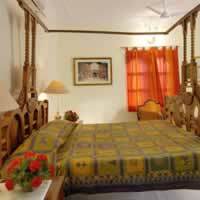 Conveniently situated on the road to the Amber Fort, it offers gracefully furnished rooms equipped with air conditioning, WiFi, mini bar, tea/coffee facilities, safe and hair dryer. The hotel also has a large outdoor swimming pool. 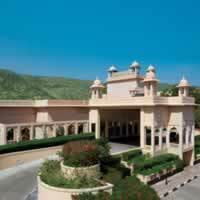 The Hilton is situated in the central business district of Jaipur, near the City Palace and Hawa Mahal. 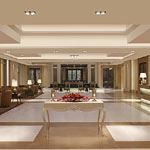 The opulence of the lobby sets the trend for this luxury hotel, combining richly decorated rooms with modern clean lines. A choice of dining options are available as well as an outdoor swimming pool and spa. All rooms have air-conditioning and complimentary WiFi, as well as all the facilities normally expected from a luxury 5 star hotel. 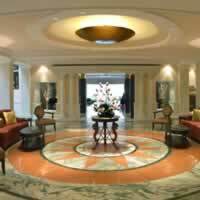 ITC Rajputana is a luxury 5-star hotel that offers a host of comforts and services in a setting that reflect the spirit of royal Rajasthan, with the regal-influenced design and gardens of the hotel echoing the city’s history. 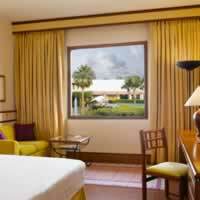 The sumptuous guest rooms have city or pool views, with separate sitting area. 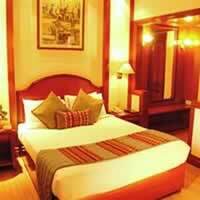 Each air conditioned guest room has quality cotton bed linen, bathrobes, hairdryer, toiletries, WiFi, TV, minibar and tea/coffee facilities. The restaurants offer tastes from around the globe, whilst specialising in traditional delicacies. There is also a large outdoor swimming pool. 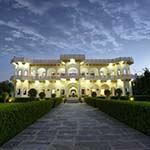 Jai Mahal Palace is set in six acres of landscaped gardens and makes lavish use of exquisite marble. Each luxury room is air-conditioned, with traditional architecture complemented by classic furniture in spacious and tastefully appointed rooms fitted with every comfort and convenience. 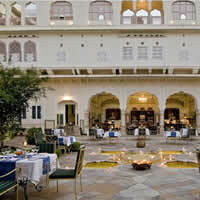 The choice of cuisine ranges from local Rajasthani, to Indian, Continental and Chinese. 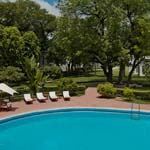 The hotel offers a heated outdoor swimming pool, tennis, badminton, croquet, volleyball, table tennis, gym with spa and barber shop. 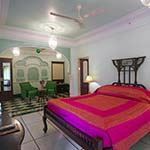 Narain Niwas Palace is a luxury heritage hotel situated close to the central park, museums, temples and bazaars of Jaipur. Its stunning royal architecture includes beautifully decorated interior walls, ceilings covered with frescoes and paintings. 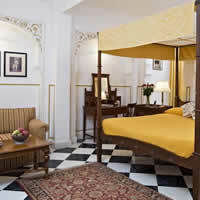 The air-conditioned en-suite guest rooms have high ceilings and period furniture, some with four-poster beds. Satellite TV, free Wi-Fi and tea/coffee making facilities are provided. 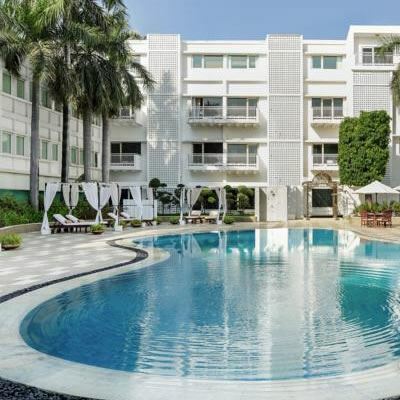 Take a dip in the outdoor swimming pool, relax in the spa and dine in one of the three restaurants that serve local Thali cuisine, international dishes, barbeques and grills. 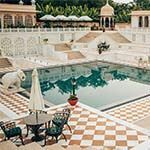 Oberoi Rajvilas is built around an 18th century Shiva temple, surrounded by 32-acres of beautifully landscaped gardens on the outskirts of Jaipur. 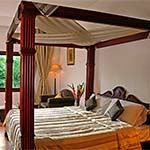 Accommodatiojn is in luxurious tents and spacious villas, some with private pools. 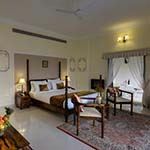 Facilities include king size bed, handwoven rugs, ornate wooden dressers and sunken white Italian marble bathtub. 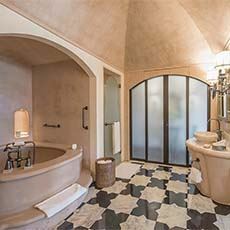 The glass panelled shower overlooks a private garden. 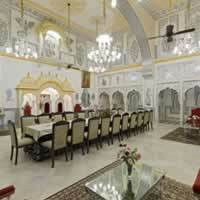 The hotel features Mughal arches, gold leaf frescoes, high domed ceilings and magnificent crystal chandeliers. There is a fine dining restaurant and an Indian speciality restaurant. There is also a luxury spa and swimming pool. Free high speed Wi-Fi is offered for up to four devices. 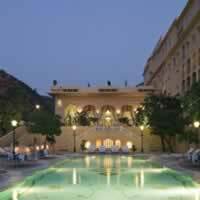 Samode Palace is a luxury heritage hotel located 45 km from the hustle and bustle of Jaipur. 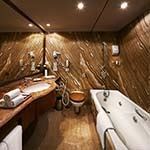 All luxury rooms have a private bathroom with shower, bath and free toiletries. Also TV with cable channels, free Wi-Fi in public areas, air conditioning and minibar. 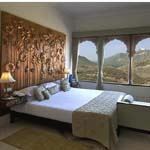 You can enjoy a mountain view from each room and the hotel has a lovely outdoor swimming pool, spa and wellness centre. With its impressive exterior and traditional royal architecture this splendid fort transports guests to a romantic, bygone era. 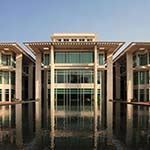 The large communal areas offer tranquil spaces in which to relax, from the inviting swimming pool to the hammam and wellness centre, and with four dining options to choose from guests can expect to be royally spoiled. 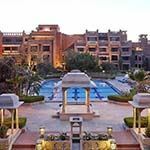 Rising out of the rocks to overlook the town of Jaisalmer, Gateway Rawalkot is the perfect combination of modern comfort and medieval charm. 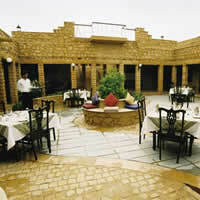 Guests can enjoy views of the 12th century Jaisalmer Fort and appreciate how the scenery changed from sunrise to sunset. 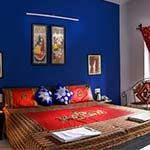 The well-appointed rooms are decorated with modern furnishings and all the normal amenities you would expect. 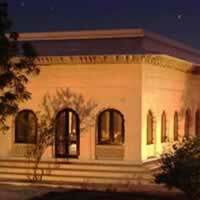 Surya Garh Palace is a luxury heritage hotel situated in Jaisalmer and features beautiful courtyards and grand Rajasthani architecture. An indoor pool, fitness centre and free Wi-Fi are available. 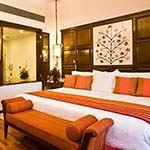 The elegant rooms at the hotel come with polished dark wood flooring, traditional handcrafted furnishings and heritage art pieces. Each well-appointed room is fitted with a flat-screen TV and minibar. A bathtub and hot shower facilities are provided. This delightful red sandstone bungalow of the 1940's has been sensitively refurbished to meet the requirements of the discerning travellers. 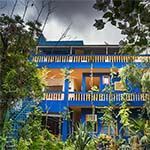 All rooms have air conditioning, Cable movies, shoe shine, full-length mirror, laundry service, refrigerator ( Suites ), Satellite television and a European bathroom with modern amenities. 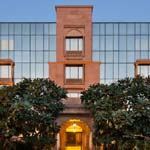 A tribute to the architectural heritage of Jodhpur, Gateway Hotel stretches across 28 acres and is great for business travellers and holidaymakers. 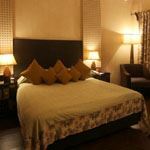 The hotel offers tradition with a contemporary twist All Rooms At The Gateway Hotel Jodhpur offer International direct dialling facility, Wi-Fi connectivity, Television with satellite programmes, Tea/Coffee maker, Mini bar and Hair dryer. 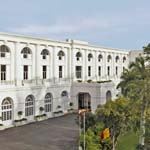 Indana Palace is a beautifully designed modern luxury hotel, where the architecture and interiors have been based on traditional Indian palaces. Guest rooms provide all modern conveniences and there is a restaurant, bar, outdoor swimming pool and spa facilities to ensure an enjoyable stay. 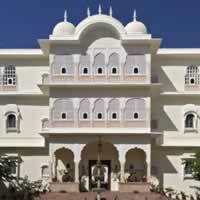 Ranbanka Palace is a beautiful hotel located in Jodhpur. The en-suite guest rooms have a flat-screen TV, air conditioning, minibar, electric kettle, hairdryer and free toiletries. 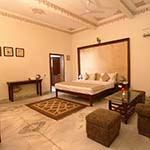 The spacious rooms also have a seating area. Other facilities include a sauna, spa, wellness centre, swimming pool and a lovely garden. Three is also Wi-Fi access. 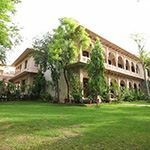 Ratan Vilas is a restored 1920's mansion, converted to a heritage hotel, situated just outside the walls of central Jodpur. It has delicately carved stone exteriors and interiors are decorated with interesting pieces of period furniture and antiques. 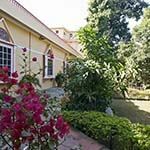 Guest rooms are arranged around a charming tiled courtyard and have comfortable beds, air-conditioning, en-suite bathroom, satellite TV, mini-bar, and tea/coffee making facilities. Free Wi-Fi is available in the shared guest areas. Relax on the terrace, enjoy the outdoor pool and dine in the courtyard or in the restaurant serving Rajasthani and Indian home cooked cuisine. 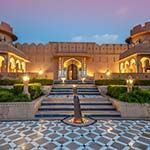 This elegant former palace was the first heritage hotel in India and offers a magical place to stay for those wishing to surround themselves with authentic Rajasthani culture. 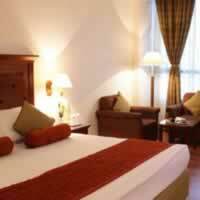 Rooms are spacious and airy with modern conveniences such as air-conditioning and wifi. 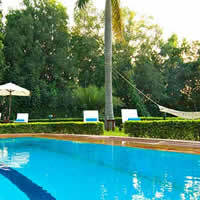 There is an outdoor pool to relax by as well as a restaurant, bar and massage services. 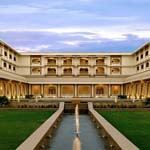 Spread over 6 acres of landscaped gardens, the luxurious Vivanta by Taj Hari Mahal resembles a 14th century royal fort. 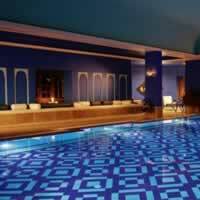 Pampering spa treatments, a large outdoor swimming pool and 24-hour fitness centre are available. 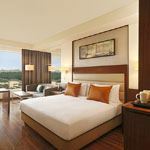 The luxury air-conditioned rooms feature original wall paintings, large windows, ergonomic work space, flat-screen TV and tea/coffee facilities. Bathrooms have massage showers and a bathtub. 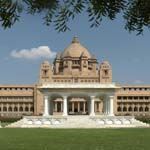 The grand sandstone Umaid Bhawan Palace is set in extensive grounds and one is immediately captured by the romance of the era. Boasting both art deco and renaissance architecture, it is a superb example of a more extravangant time and its 26 hectare estate makes it one of the largest private residences in the world. 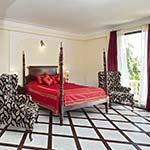 Facilities include two swimming pools, a spa, hammam, library and fitness centre and all rooms are furnished with antiques. 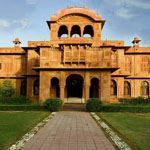 Ranthambore Heritage Haveli is a traditionally designed Rajasthani resort located in Sawai Modhopur, near the entrance to the famous tiger reserve. 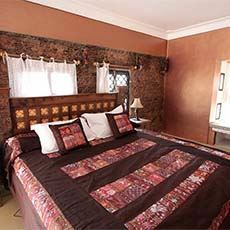 Guest cottages have all modern amenities, including en-suite bathrooms with rain showers. Delicious fresh food is served in the multi-cuisine restaurant and you can swim laps in the large outdoor pool. 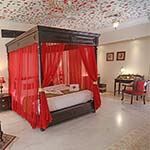 Ayurvedic massages are available and there is also a steam room. Free WiFi is available in the reception area. 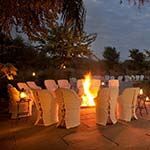 Tiger Den Resort is nestled in the Aravalli hills of Ranthambhore National Park, only five minutes from the main entrance to the national park. Each guest room is tastefully furnished with en-suite shower, and all bedrooms have large windows with panoramic views of the surrounding countryside. 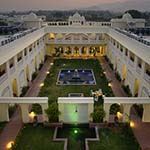 Anuraga Palace is one of the oldest hotels in Sawai Madhopur and is situated close to the entrance to Ranthambore National Park. 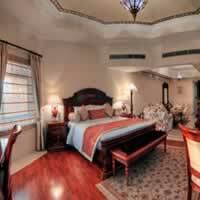 The spacious en-suite guest rooms are decorated in colonial style with floral patterns, tapestries and embellished ceilings. 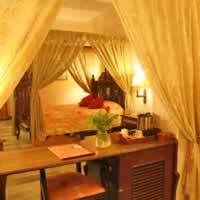 Some rooms have four poster beds. 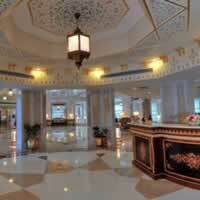 Satellite TV, Wi-Fi, air conditioning, bathrobes, minibar and tea/coffee facilities are provided. 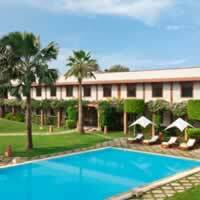 Guests can enjoy the gardens, swimming pool and restaurant that serves both regional and international cuisine. 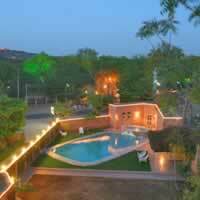 Dev Vilas is a luxury hotel set in 3.5-acres of gargens, close to the entrance to Ranthambore National Park. 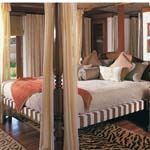 Spacious deluxe rooms are located in the main lodge and tented bungalows are situated in the gardens. 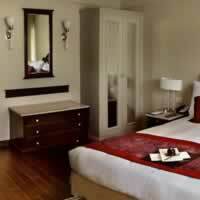 All guest rooms are well appointed and en-suite, with all modern facilities. There is also a large outdoor swimming pool for your enjoyment. 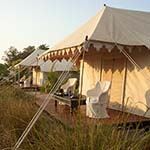 Khem Villas is a luxury jungle camp situated on the outskirts of Ranthambore Tiger Reserve. 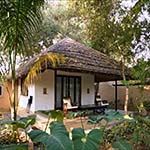 Spacious cottages have en-suite bathrooms with large old fashioned bathtubs & open-to-sky outdoor showers, as well as private courtyards and verandas looking towards the tiger reserve. 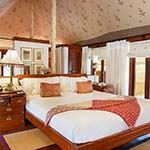 Alternatively you can stay in luxury en-suite tents erected on wooden platforms, or in a bedroom in the main building. All building materials have been locally sourced. The Indian, Western and Oriental cuisine served in the restaurant is all vegetarian, with most ingredients sourced from their organic farm. 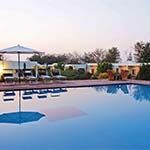 Pugmark is set in 10-acres of property adjacent to Ranthambore National Park, in the Sawai Madhopur district of Rajasthan. 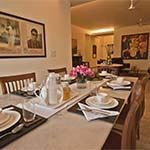 The well appointed luxury air-conditioned cottages have all modern amenities including minibar and tea / coffee facilities. 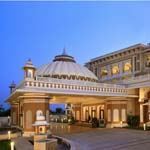 The hotel also offers live cooking demostrations and Ayurveda spa treatments. In the evening you can dine in the Cave Palate, a multi-cuisine buffet restaurant, and enjoy live Rajasthani cultural performances. There is also a large outdoor swimming pool. 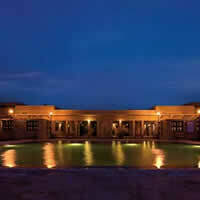 Ranthambhore Regency is a family run hotel that offers relaxation along with a personal touch. 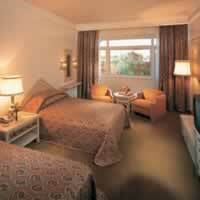 The luxury en-suite guest rooms are either poolside or garden facing, each with a mini bar, TV and air-conditioning. There is Wi-Fi available at reception and a large outdoor swimming pool. 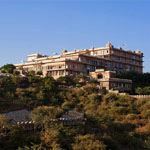 Lying at the foot of the Aravali Hills, the impressive Nahargarh Rathambore hotel has been designed in the style of a 16th-century Indian palace. 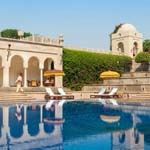 This luxury boutique hotel has a sprawling Mughal-inspired garden and a large outdoor swimming pool. 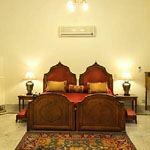 Beautiful tiled flooring and intricately carved traditional Indian furniture feature in all the spacious air-conditioned rooms. All come with a cable TV, Wi-Fi, kettle and fridge. 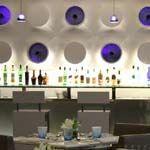 You can relax in the bar and dine in the restaurant that serves international cuisine. 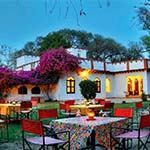 Oberoi Vanyavilas was designed to resemble a traditional Rajasthani haveli (mansion) and is spread over 20-acres of landscaped gardens, less than ten minutes drive from Ranthambhore Tiger Reserve. From the observation tower, guests can enjoy panoramic views of the park and spot wildlife visiting the nearby waterhole. 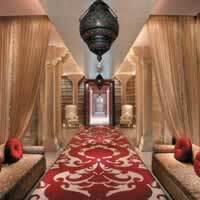 The restaurant offers authentic Rajasthani cuisine, as well as pan-Indian and continental dishes.The spa offers a wide range of Ayurvedic inspired and signature Oberoi treatments. Traditional bonfires are lit in the winter and live folk musicians play all year round. Free high speed Wi-Fi is offered for up to four devices. 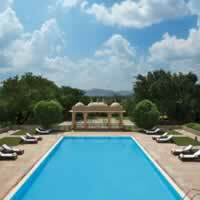 The Tigress is a luxury resort situated in Sawai Madhopur, close to the famous Ranthambore Tiger Reserve. 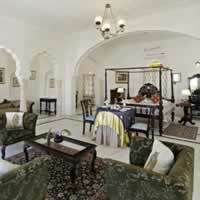 Spacious suites and villas are tastefully designed, with all modern amenities to ensure a memorable stay. 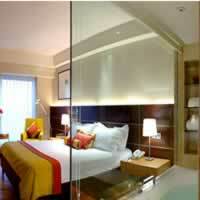 Every en-suite guestroom has a living area, air conditioning, minibar, TV, private outdoor area and free WiFi. 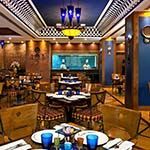 You can dine at a selection of three restaurants, where expect chefs combine the traditional flavours of India with international cuisine, using the freshest ingredients. There is an outdoor swimming pool and a wide range of spa and wellness treatments available. 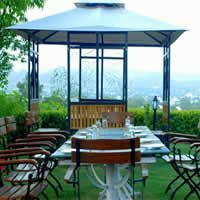 The Hotel Hilltop is located on top of Ambavgarh Hill. 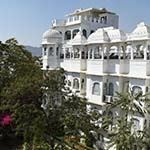 Ambavgarh Hill is the highest point of Udaipur overlooking Lake Fatehsagar, Swaroop Sagar & the town. 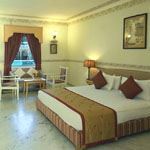 The Hotel rooms, all feature a bed with an orthopaedic mattress, individual open terrace overlooking the panoramic view of Lake Fatehsagar & the town, satellite TV, an air conditioning, hot and cold water and telephone. 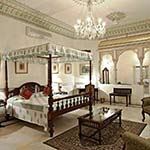 Amet Haveli is a restored luxury 18th century heritage hotel in Udaipur, 'the City of Lakes', offering wonderful views of the City Palace and the Taj Lake Palace. 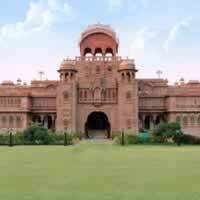 It's architecture is influenced by Agra Fort's Mughal Gardens, admired for it's pleasure garden and green lawns. 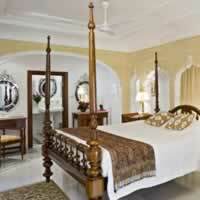 Each en-suite room, some with lake views, have elegant decor with traditional Indian style furniture. 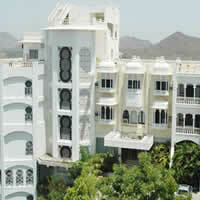 Air-conditioning, free Wi-Fi, safe, tea / coffee making facilities, satellite TV and mini-bar are provided. 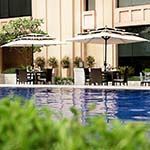 Enjoy the swimming pool and dine in the restaurant or on the lakeside terrace, serving International and Asian cuisine. Set in 43 acres of lush green landscaping, Trident hotel is located on the banks of the picturesque Pichola Lake and is the perfect base for exploring the city of Udaipur, acclaimed worldwide for its beautiful lakes, medieval palaces and colourful bazaars. 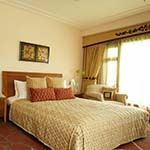 All rooms are equipped with air conditioning , WiFi, mini bar, tea/coffee facilities, satellite TV, electronic safe and hair dryer. 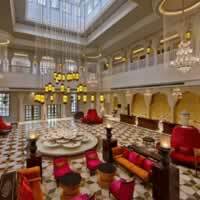 Udai Kothi is a modern hotel built in a heritage-style with traditional palacial architecture and decor, situated in the heart of Udaipur. 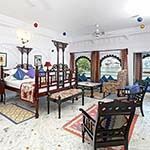 The en-suite, air-conditioned rooms have comfortable beds, period furniture, fresco painted walls and breathtaking views of the historic city and Lake Pichola. 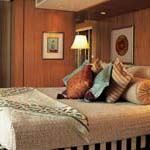 Each has satellite TV, mini-bar, tea / coffee making facilities and Wi-Fi. Relax in the spa and the gardens and enjoy the outdoor, indoor and rooftop pools. Dine in the terrace restaurant on regional, Chinese and European cuisine while the sun sets over the lake. 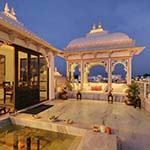 With panoramic views of the Aravalli Mountains this impressive palace is perched high on a hillside above the city of Udaipur. Rooms have large windows taking in the sweeping views of the surrounding countryside and there is a luxury spa and swimming pool allowing guests to unwind in style. There is also a library, restaurant and bar as well as a large collection of vintage cars to admire. 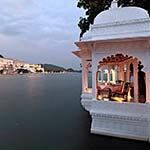 Taj Lake Palace is spectacularly situated in the middle of Lake Pichola. 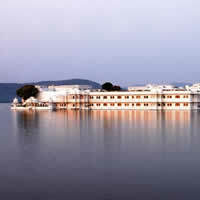 Built with marble and featuring majestic architecture, it is one of the most famous hotels in all of India. The hotel offers a full service spa and customised programmes including yoga sessions. 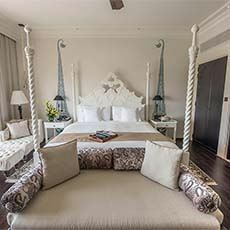 Each luxury room comes with a butler service and is decorated with beautifully carved wooden furniture and gorgeous silk fabrics. 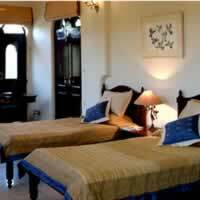 Each bedroom has a flat-screen TV and a garden or lake view.The hotel also has a shopping arcade, games room and business centre.